We’re knee deep into spring, summer almost here, and we’re happily stuck at home. Wait?! What?! You two trailmix eating, take your dogs everywhere, wanderlust, camping addicts are not travelling?! What gives?! Well, one big reason we’re not brewing coffee on a campfire this morning is because we have this project to work on… Ummm, what is that? Was the hubs famous words when I showed him the craigslist ad. 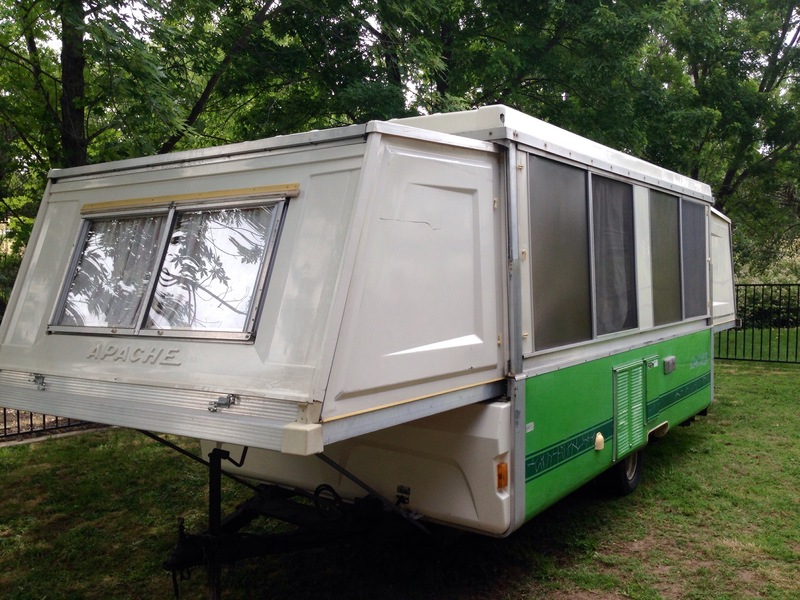 For 6 long years I’ve wanted a vintage trailer. Airstreams were my first love, followed by Canned Hams, Shastas, Aristocrat Lo-liners, Casitas, the list can go on and on. Problem has been, so has everyone else. 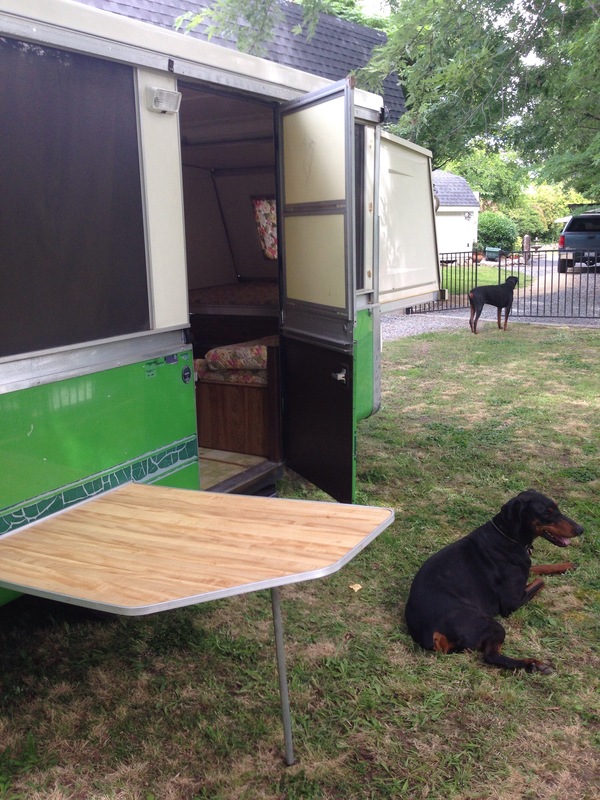 With TV shows like Flipping Rvs now, restoring vintage ️trailers is the new “thing”. Leaving only the trailers (that met our minuscule budget), were the hopeless, rotted out, run-from-screaming kind of projects. 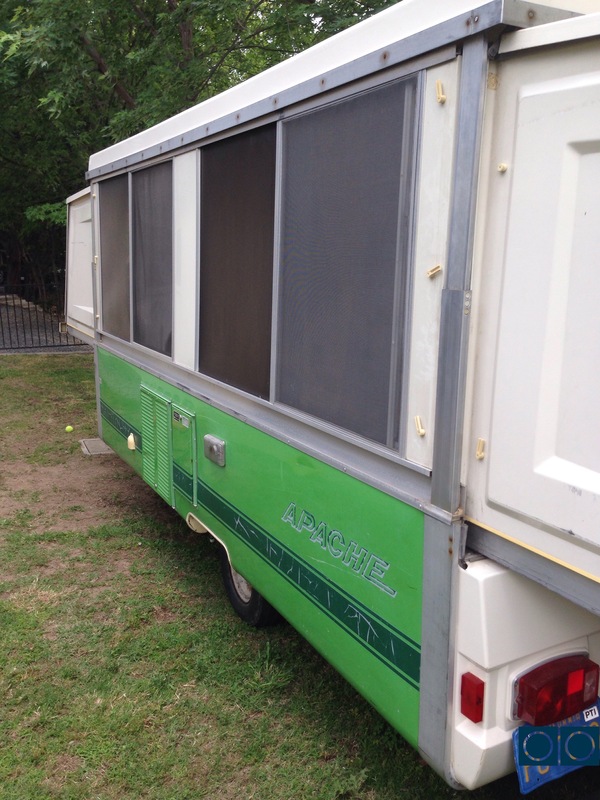 Another obstacle in our search for a vintage trailer has been the size requirements. We literally have the perfect space for storing a trailer, but it had to be under 7.5 feet wide to get it through our gate. Nor did we want to pull some massive beast, guzzling up gas along the way. 3. Can I get a king bed? Or at least not squished together on a full size bed. 2. Umm who says you get to drive and haul it all the time? 3. Agree, but I’m thinking about where to put the pups? Unfortunately as we researched and shopped, all signs were pointed towards a newer (1990s) trailer or pop up tent trailer. My dreams of vintage fixers were sadly fading away. 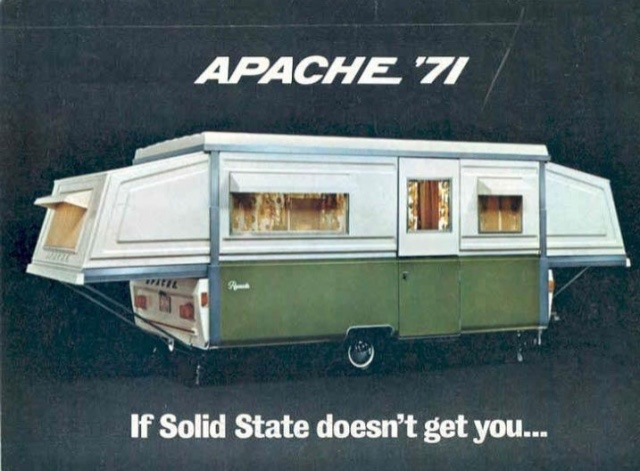 It wasn’t until I saw a 1970s Apache hard sided pop up listed on Craigslist last month. I was literally the fourth person to call the seller. Five minutes later the ad was taken down (apparently there was so much interest and potential buyers the poor guy had to remove the ad) he had three buyers lined up already for Monday morning. 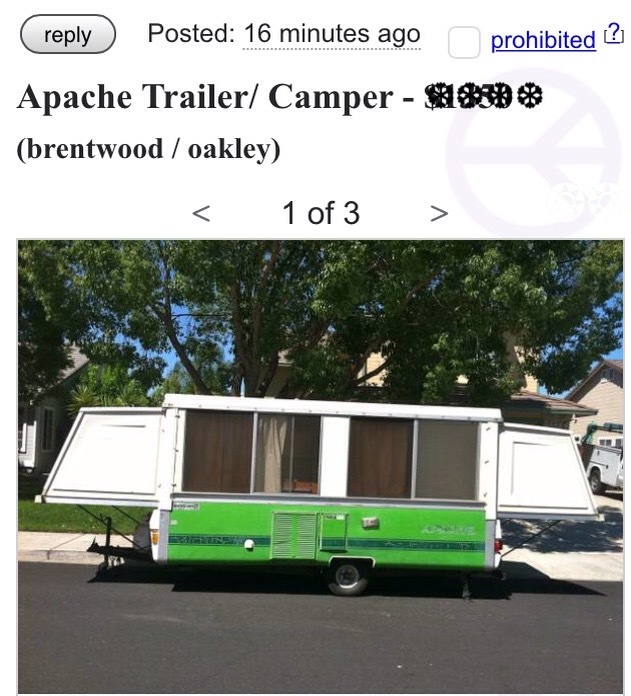 Then the same Apache trailer craigslist ad resurfaced (not lying) morning of my birthday. This time the price had been increased by almost $400. Originally the seller hadn’t realized the cult following of these solid state beauties. Luckily we drove 70 miles for an “as is” trailer, only to find out it was in better condition then expected. Garaged most of its existence, you could tell it was once well loved. Two owners only (including the seller), and a clean title, with all original manuals. The current owner had planned to rehab it as a side project, but realized he didn’t have the time for it. (He also admitted he was tired of the selling process and Craigslist “flakes”…I guess persistence pays off😉) In the end he sold it to us for the original listing price and threw in for free the $250 worth of replacement parts/materials he previously purchased. 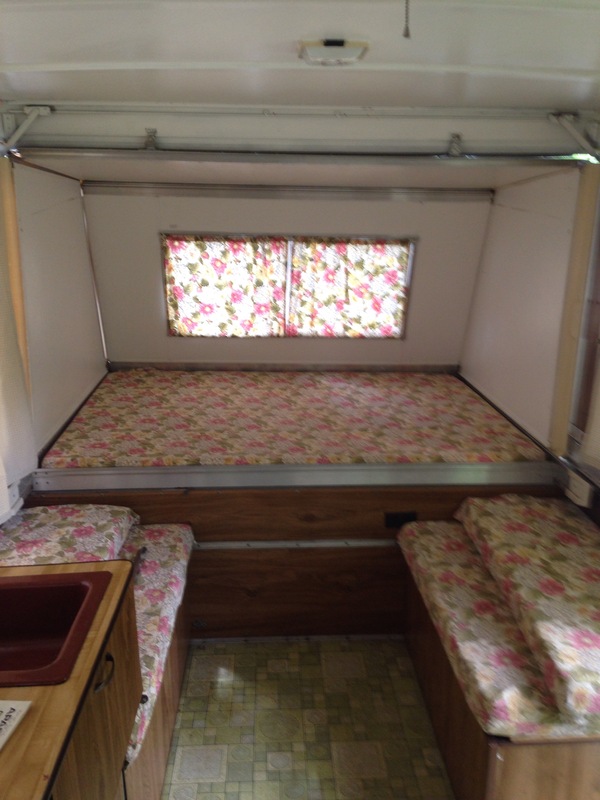 We’ll be working on this project over the summer, ending with a “maiden voyage” camping trip in Santa Cruz. There is so much design potential, and we’ll also include important nuts and bolts of trailer repair. Luckily for us rookies, there is a plethora of websites and groups focused on rehabbing vintage Apache pop ups. Our goal is to condense these great resources down into bite size pieces and specific projects in this makeover series. Right now she’s hanging out at the parents house waiting to be lifted. (More to come in the following weeks!) Happy Sunday everyone!